Beautiful sea stack formation, called the Flowerpot on Flowerpot Island in Lake Huron in Fathom Five National Marine Park. 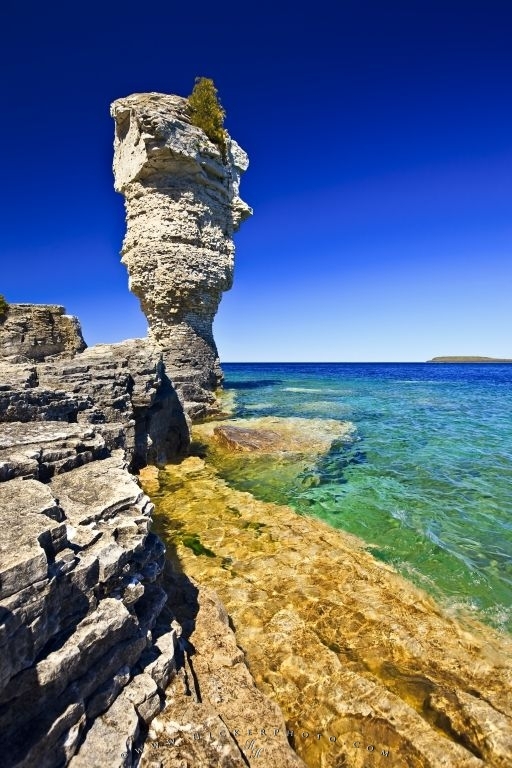 Situated on the eastern shoreline of Flowerpot Island, this sea stack is one of the attractions on this island which forms part of the Fathom Five National Park in Lake Huron, Ontario, Canada. Flowerpot Island is only accessible by boat and features natural sea stacks, over 4 kilometres of walking trails, campsites, a historic light station, caves and natural beauty. Sea Stack along the shoreline of Flowerpot Island in the Fathom Five National Marine Park, Lake Huron, Ontario, Canada. Photo of a sea stack on Flowerpot Island in the Fathom Five National Marine Park in Lake Huron. Pictures from photo gallery "Lake Huron"
This picture is part of the photo album "Lake Huron" - there are more beautiful images waiting for you.